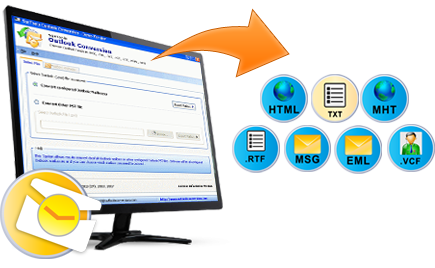 Convert Outlook Data into Multiple formats like EML, MSG, HTML, VCF, TXT, RTF and MHT. Two Options to Add PST files: Add configured Mailbox or Select & Add Other PST file. Software maintains the data integrity while converting it into any format like To, Bcc, Cc, Sent and Receive date etc. Support all 32 and 64 bit Outlook versions like 2013, 2010, 2007 and 2003 etc. PST file conversion tool allows to export items of PST file like email messages, calendars, contacts, task notes, journals and draft etc into distinct file format. Software allows saving PST files into numerous file types. As it saves messages in EML, MSG, TXT, MHT, RTF and HTML format and address book contacts into VCF format. Convert Configured Outlook Mailboxes: Software will list all the configured mailboxes and you have to select the desired one to export. Software will list all the items once you select and export Outlook mailbox. Now in order to export selective items of Outlook data file, you can check or uncheck folder accordingly. 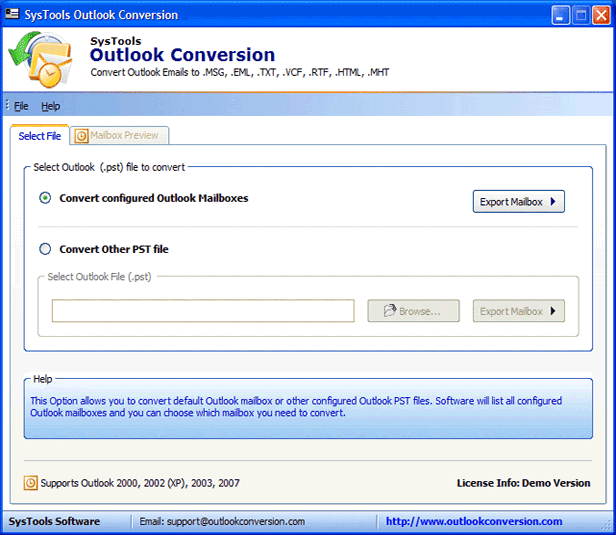 Outlook Conversion software will convert only selective items from PST file rather than all. As you choose an appropriate file format and convert items, software will generate folders at its destination. It will save messages in Inbox into Inbox folder, messages in Outbox into Outbox folder and Contacts in contact folder so on. Thus, it will restore data into their specific folders. Outlook conversion software keeps meta data like: To, Cc, Bcc etc intact while exporting items into any format. There will be no adjustments done to original structure of files. The software will maintain all images, hyperlinks and attachments identify with emails. Click on start conversion button to initiate conversion process after that select location where you want to save files after conversion. Choose desired file format among the given set of formats for saving Outlook PST file. 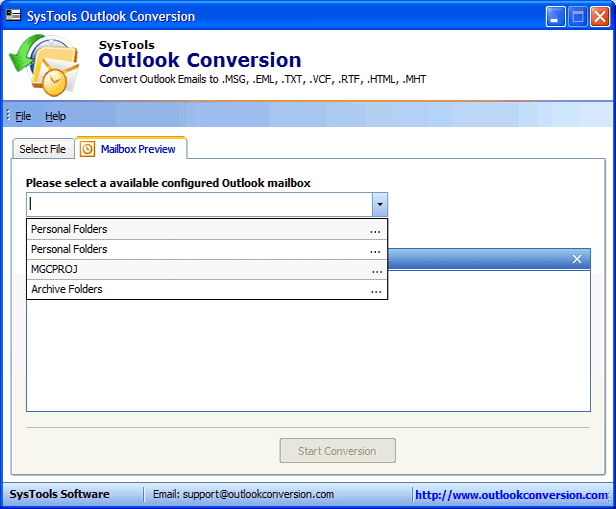 Try out Free demo version of Outlook Conversion tool before investing your money. By the using of trial pack you can convert and save up to 15 Outlook data files to desired format within short span of time. 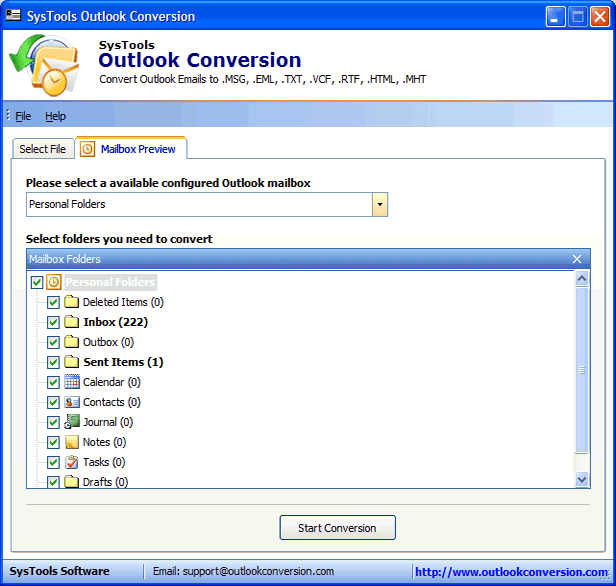 Outlook Conversion Tool allows you to convert Outlook data- emails, journals, contacts, to-do list, calendars, alarm etc into wide range of formats. 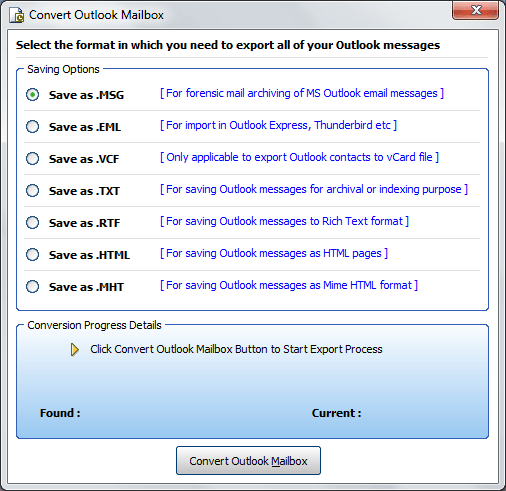 Outlook conversion act as single package embedded with multiple formats like–HTML, RTF, EML, MSG, MHT, VCF, TXT etc. Here, attached video previews step by step process for how to convert Outlook to multiple formats within fraction of seconds. Watch FREE Online Video and learn how software actually works!! !